It was a tale of two teams on Thursday as the Seward County baseball team (16-14, 4-6) split a double header against Cloud County, losing the first game from a walk-off 5-2 before run-ruling the T-Birds in game two, 14-0. Tanner King got the start on the mound, pitching 6.0 innings while giving up two runs on eight hits. Hunter Ratcliffe (0-1) came in for relief in the seventh inning, pitching the final 2.1 innings. He gave up three runs off two hits, including the game winning home run in the bottom of the ninth. Seward managed eight hits on the day, but could only get two runs to cross the plate, leaving six runners on base. Spencer Sackett and Benny Ayala came away with the only RBI in the game. The Saints jumped on the board early with a solo home run by Sackett in the top of the first inning. They followed up in the second with another run, this time coming from Ayala’s single to centerfield to score Tidwell, who reached on a single earlier in the inning. The T-Birds cut into the two-run lead in the bottom of the third. With runners on first and second, Ryan Krolikowski singled to left field to bring the game to 2-1. As the pitching tightened up, neither team could get their offense going, until the T-Birds tied the game in the bottom of the seventh. Following a leadoff triple, Erik Sabrowski singled to left field to tie the game two to force extra inning. After both sides were retired in the eighth, the T-Birds took their chance to end the game in the ninth. A leadoff single, followed by an intentional walk of Sabrowski gave Krolikowski baserunners as he proceeded to crank a ball over the left field wall to end the game in walk off fashion, giving Cloud the win, 5-2. Cole Evans (4-2) was dealing in game two, giving up just two hits in 5.0 innings, while striking out nine batters. He didn’t allow a single run as the Saints shut out the T-Birds. Seward Finished with 10 hits in second game with Dylan Paul (3), Sackett (2), and Joe Kuhn (2) each finishing with multiple hits. 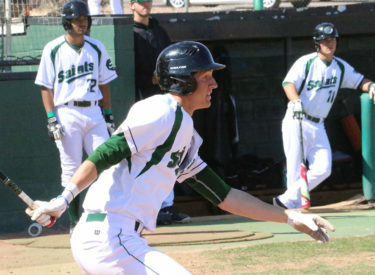 Paul led the Saints with seven RBI on the day, with four coming from a fifth inning grand slam. The Saints got on board in the first inning again after a Kuhn hit a hard ground ball to short stop to cause an error, scoring Sackett, who reached on a double. Following a scoreless second inning, the Saints exploded for five runs in the third. Sackett reached on a single to left field before Paul hit his first of two home runs on the day to make it 3-0. Kuhn followed up Paul’s home run with one of his own. Tidwell reached on a single to left field before Cody Coontz hit the third home run of the inning to increase the lead to 6-0. Two walks put runners on first and second for Paul, who promptly emptied the bases with a single to right field, advancing to third with an error from the first basemen. He scored on the next pitch from a wild pitch to make it 9-0. Kuhn hit his second solo home run of the day to give the Saints a double-digit lead. A single and two walks loaded the bases for the red-hot Paul as he stepped up to the plate to make sure the game ended from the run-rule. He drilled the ball over the right-center field wall for the grand slam to make it 14-0. Evans allowed just one hit in the bottom of the fifth to end the game and give the Saints the victory. Seward will complete the series against Cloud on Saturday (March 24) with a double header starting at 1:00 p.m. at Brent Gould Field.